After operating a little more than a year, the Amazon Wind Farm, North Carolina’s only large-scale wind energy project, continues to cause concerns. The project — located in Perquimans and Pasquotank counties near Elizabeth City — generated just 75 percent of its expected power. Military officials also remain uneasy about the wind farm’s interference with a sophisticated radar facility that provides crucial intelligence for the United States. Interference with military operations may be the project’s Achilles’ heel — and it may spell trouble for other large wind projects considered for the region. Last year, North Carolina legislative leaders asked the Trump administration to consider shutting down the $400-million, 208-megawatt, 104-turbine project. State lawmakers said the massive turbines would interfere with the U. S. Navy’s Relocatable Over-the-Horizon-Radar facility, or ROTHR, in southern Virginia, bordering North Carolina’s Currituck County. The sophisticated ROTHR receiver plays a key role in the military’s tracking of aircraft and ships suspected of transporting illegal drugs and other banned substances to the United States. The Navy commissioned a study on the interference which will be released this spring, Katisha Draughn-Fraguada, a public affairs officer for Naval Support Activity Hampton Roads, told Carolina Journal. Nor has local opposition to the project eased. Currituck County Commissioner Paul Beaumont, a former U. S. Navy pilot, recently toured the ROTHR facility. He said ROTHR personnel made it clear to him that the Amazon Wind Farm has degraded signal reception. ROTHR has trouble detecting and identifying targets of interest, including fast moving and semi-submersible watercraft, because of interference from the wind farm. 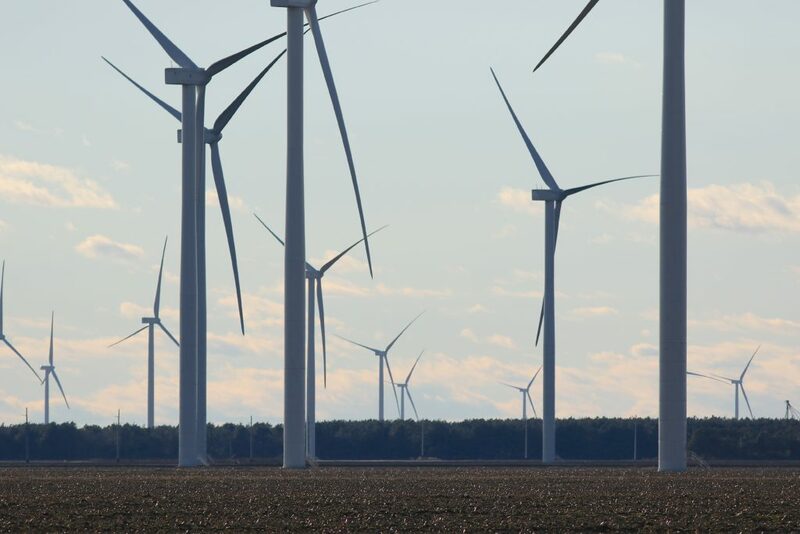 “In the name of national security, I want wind farms to be removed as a permitted use in Currituck County,” he said, and he will ask fellow commissioners to support the change. The wind project was built and is operated by Avangrid Renewables, a subsidiary of Madrid-based Iberdrola Group. Online retailer and data center operator Amazon agreed to buy the electrical power generated by the project and assumed naming rights. The Amazon Wind Farm went into operation in December 2016 and was fully operational in February 2017. Amazon and Avangrid said it should generate approximately 670,000 megawatt hours of wind energy annually — or enough to power more than 61,000 U.S. homes in a year. Carolina Journal has tracked the project using data from the U.S. Energy Information Administration. For the 12-month period spanning February 2017 and January 2018, the project reported generating only 503,914 MWH, or 75 percent of projected output. 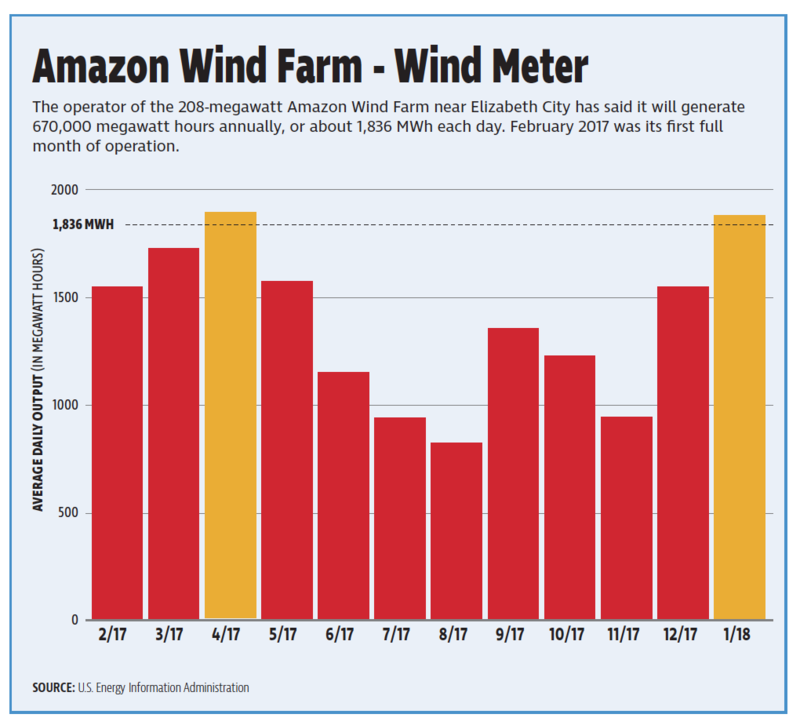 April 2017 and January 2018 were the only two months the wind farm produced more than the 1,836 MWH/day needed to satisfy Amazon’s projected production levels. Three months it produced less than half that amount. Avangrid did not respond to CJ’s questions about the lower power output and the radar interference issues. In June 2012, the government’s ROTHR Program Office released a study concluding that a large-scale wind farm should be no closer than 28 miles from a ROTHR facility to prevent interference with the radar’s operation. The Navy released a map showing the “interference awareness area” in relation to the ROTHR receiving facility in southern Virginia. The Amazon Wind Farm covers about 20,000 acres. It begins about 14 miles from the ROTHR facility stretching to a point about 22 miles away. It is entirely within the 28-mile interference awareness area described in the 2012 study. Under the agreement, the Navy would “discuss strategies” with Iberdrola Renewables [Avangrid] if the installation adversely affected radar operations. But under the agreement, if the turbines compromised the radar facility’s effectiveness, the Navy had no option to terminate the project or force Avangrid to reduce the wind farm’s operations. If the Navy detects an adverse impact from the turbines, the parties will “confer with the assistance of a mutually acceptable technical expert” and discuss strategies likely to prevent problems. The legislators’ 2017 request to the Trump administration — signed by House Speaker Tim Moore, R-Cleveland, Senate leader Phil Berger, R-Rockingham, and seven other General Assembly members — was addressed to retired Marine Corps Gen. John Kelly, who became Trump’s secretary of homeland security and then the president’s chief of staff. Kelly commanded the U.S. Southern Command from November 2012 – January 2016. In that role, he oversaw all military operations in Central and South America and the Caribbean. The radar system provides critical surveillance capability to support the Southern Command’s program to detect and monitor drug-smuggling aircraft and ships from Central and South America. CJ first reported on the potential conflicts involving the wind farm and the radar facility in September 2015. Kelly had testified before Congress about the project, and that testimony was noted in the CJ story. “We are working within the Department of Defense and with developers and stakeholders to develop potential mitigation solutions, but I have little confidence we will succeed,” Kelly told the House Armed Services Committee in February 2014. Kelly’s Southern Command successor, Admiral Kurt W. Tidd, also expressed concerns about wind farm interference with ROTHR installations in testimonies to the Senate Armed Services Committee in April 2017 and February 2018.